If you're like me, you rule, and your mind is obsessed with sewing. Let me explain. When I see a person walk in a room, I now look at the seams or collar of whatever they are wearing first, even before their face. And now this: I couldn't even enjoy a comedy video. Watch this. Now it should be a cute video of some old ladies being hip, but all I can notice is two of the old ladies are wearing very different dresses, but made out of the same fabric. I hope someone else out there can relate. Any who, my yellow dress has hit a snag. Everything was going grand until I attached the skirt to the top. I'm starting to think I forgot to cut 2 side panels of the skirt, because when I pleated it just as marked, it came out like 16 inches off. 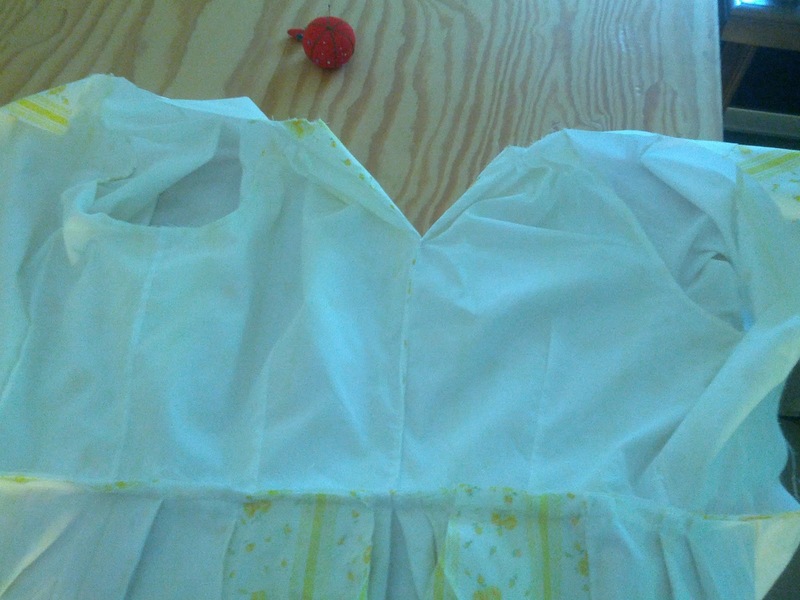 I removed some of the pleats to make it fit. It needs some work. It looks way better on the form than on me. 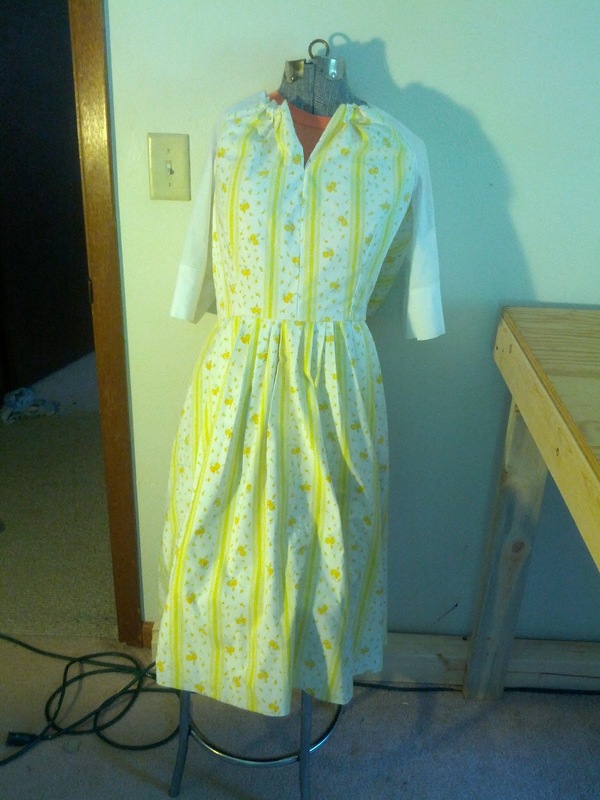 It looks like a country bumpkin dress. I'm swimming in the sleeves, and the waist is a little tight, but I haven't put in the zipper yet so maybe I can do something about it still. I think I might go against all that I stand for and remove the sleeves...I need to spend a day staring at it to figure out how to fit what I'm not sure went wrong. I am a fan of the lining though. 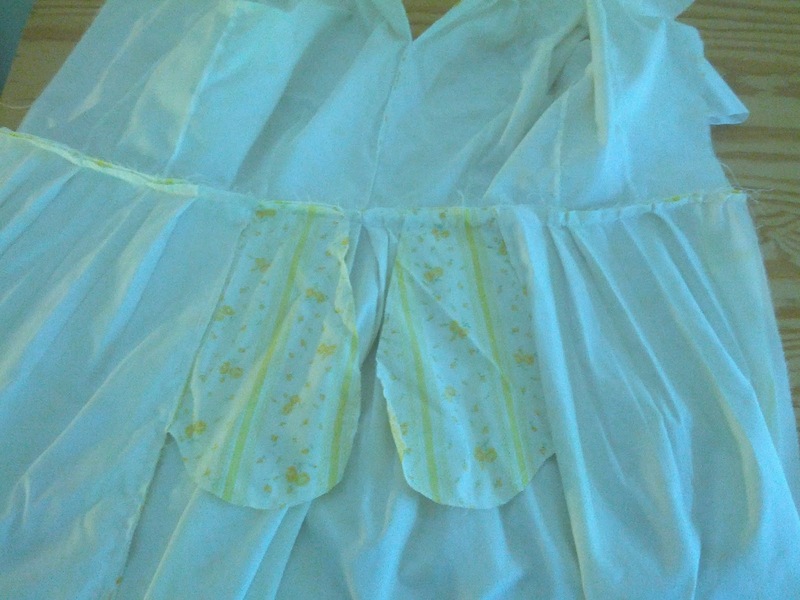 One oversight I had was that I flipped two of the side lining panels, leaving seams visible. I only had it in my head that the lining's purpose was to make it not see through. I had forgotten that all seams can be hidden on the inside. You live and you learn right?